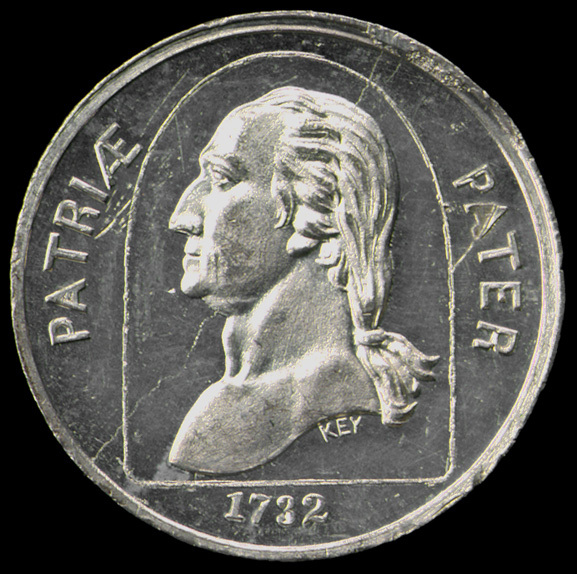 Comments: The obverse shows an undraped bust left of Washington in an arched frame. Note there is a die crack that travels from the bottom rim at about 7:00 o'clock up through Washington's throat and jawbone it is less noticeable along the hair where it continues to the rim at about 1:00 o'clock. The reverse contains the legend in the central field encompassed in a circle of 32 five pointed stars. The address of F.C. 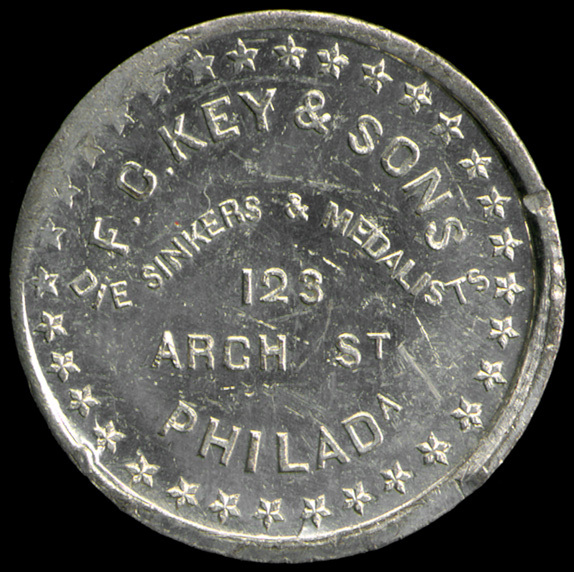 Key and Sons was 123 Arch Street in Philadelphia from about 1850 until 1857-58. Sometime during 1857-58 the location was renumbered as 329 Arch Street. Key used this obverse die for his storecard Baker 550 described below. 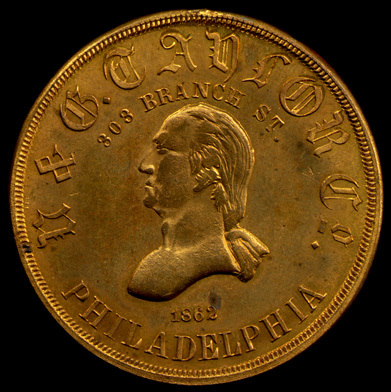 It was also used for the storecard for the New York Coin dealer E. Hill (Baker 542, Miller NY 305) dated 1860 and was used by the New York City diesinker George Hampden Lovett who made a variety of mulings with the Key obverse (Baker 633 636) (described on the pages for New York Washington storecards in the entries for Lovett). Reference: Rulau and Fuld, p. 271; Rulau, Standard Catalog of United States Tokens, 2nd ed., p. 285. 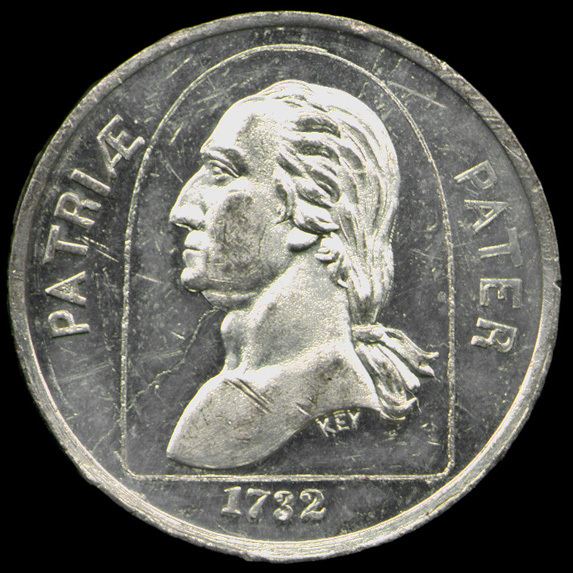 Comments: The obverse shows an undraped bust left of Washington in an arched frame. Note there is a die crack that travels from the top of his throat to the rim. The reverse contains the legend in the outline of the work KEY within a field in 33 six pointed stars. The address of F.C. Key and Sons was 123 Arch Street in Philadelphia from about 1850 until 1857-58. Sometime during 1857-58 the location was renumbered as 329 Arch Street. 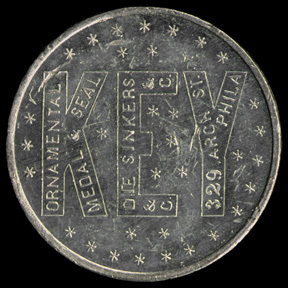 Key used this obverse die for his storecard Baker 549 described above. It was also used for the storecard for the New York Coin dealer E. Hill (Baker 542, Miller NY 305) dated 1860 and was used by the New York City diesinker George Hampden Lovett who made a variety of mulings with the Key obverse (Baker 633 636) (described on the pages for New York Washington storecards in the entries for Lovett). 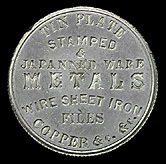 References: Rulau and Fuld, p. 271; this variety is not listed in Rulau, Standard Catalog of United States Tokens, 2nd ed., for other F. C. Key tokens see p. 285. 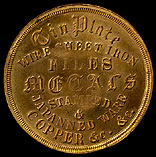 Reverse: TIN PLATE [in gothic letters] / WIRE SHEET IRON / FILES / METALS [in gothic letters] / STAMPED / & / JAPANNED WARE / COPPER & C. & C.
Comments: This token displays an undraped bust left of Washington. As it dates to 1862 it is a civil war storecard but because of its large size it is also collected as part of the Merchant storecard series, thus it has a Fuld civil war token number as well as a Miller merchant token number. It is one of two closely related varieties found only in brass. 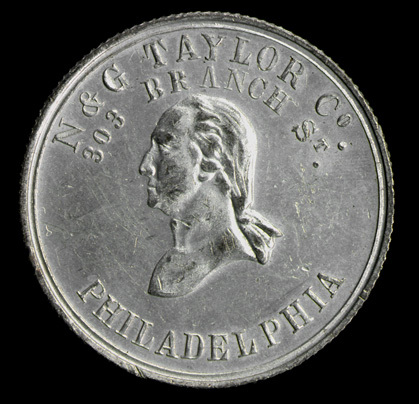 In the example shown above, Baker 578, on the obverse the address line is in smaller letters, starting under the G. and ending under the letter O while in the other type, Baker 577, the address starts under the final stroke of the N and continues to the C in Co. On the reverse note the doubling of the P in PLATE and the die cracks at the top of the O and the bow of the first P in COPPER. Reference: Rulau and Fuld, p. 272; Fuld, United States Civil War Storecards, 2nd ed. p. 492. Reverse: TIN PLATE / STAMPED / & / JAPANNED WARE / METALS / WIRE SHEET IRON / FILES / COPPER & C. & C.
Comments: This token displays an undraped bust left of Washington. It is collected as a civil war storecard but because of its large size it is also included as part of the Merchant storecard series, thus it has a Fuld civil war token number as well as a Miller merchant token number. The same central design punch was used to produce the Washington portrait on this die as on the die for Baker 577 but using different letter punches. 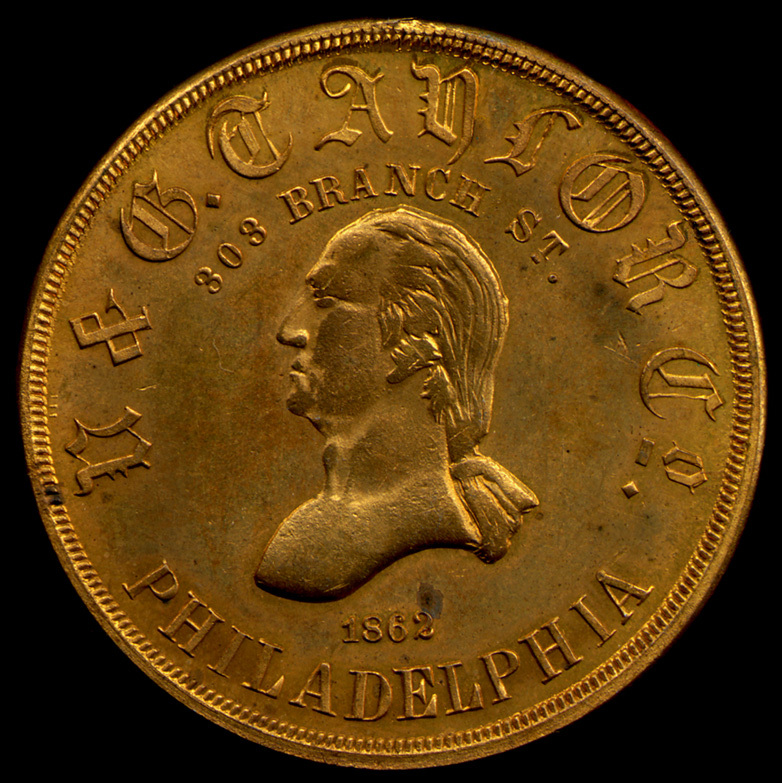 ALso this token is undated. Although given a higher Baker number this piece may precede Baker 577 chronologically. 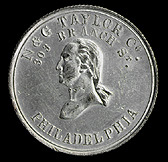 A much smaller Washington bust right portrait is found on the 1863 dated Taylor token; leading one to suspect the dundated token may be the first of the Tarlor Washington series, possibly from 1860. 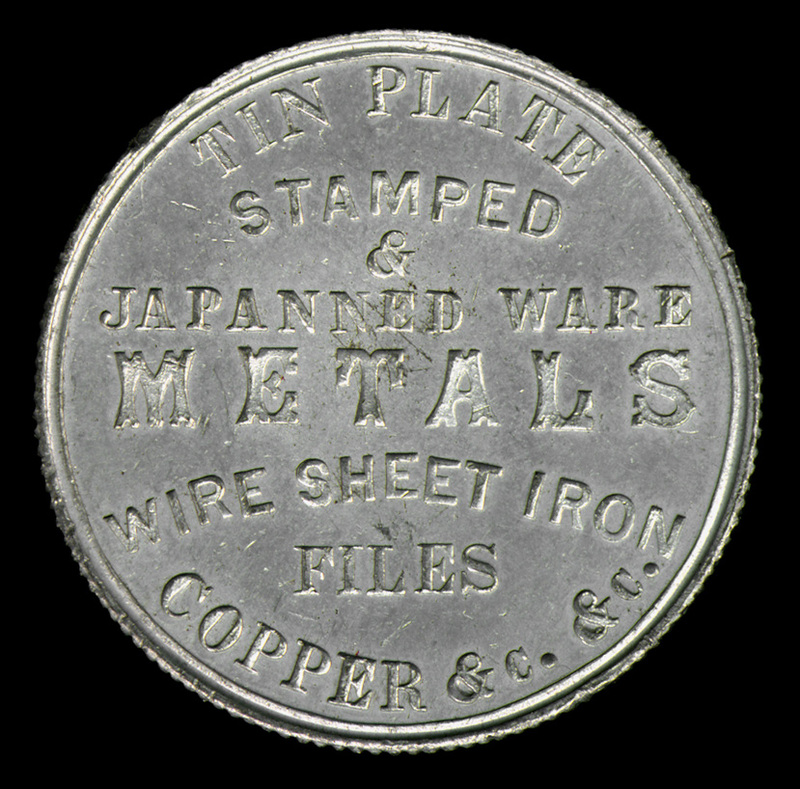 Baker 579 is found in brass and white metal; the brass comes in two very similar reverses that differ slightly in spacing. In one variety the word FILES is slightly larger that the word SHEET (in FILES there is extra space between the letters I and L), while in the other version the two words are the same size. 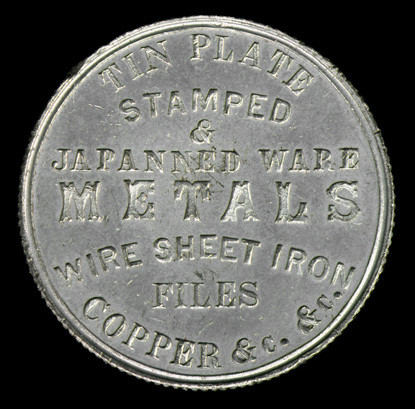 The white metal variety shows the word FILES and SHEET as the same size, without extra space between the I and L.
References: Reference: Rulau and Fuld, p. 272; Fuld, United States Civil War Storecards, 2nd ed. p. 492.